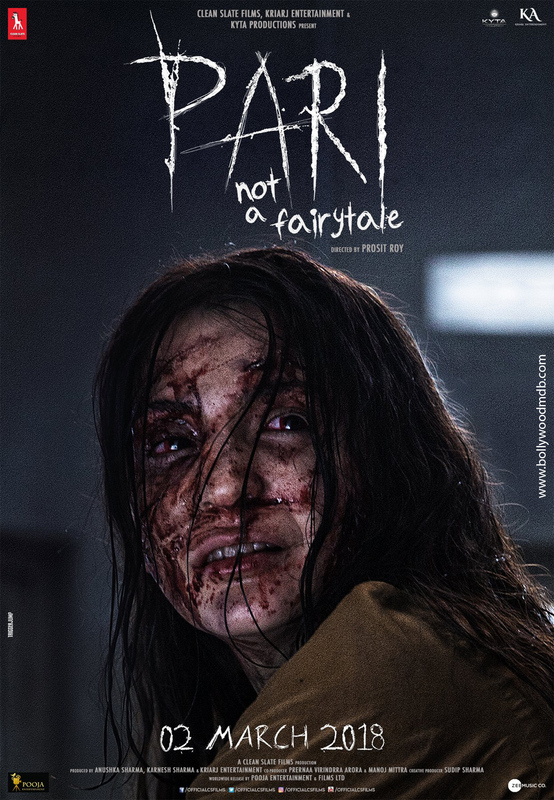 Pari Review: A revolution in the Indian horror film genre. Simply Brilliant! Anushka Sharma’s debut step in the horror genre is turned into a win-win venture for her. Read in-depth review only on BollywoodMDB. Positive points: Screenplay, Performances, Direction and Cinematography. Ruksana aka Pari (Anushka Sharma) meets Arnab (Parambrata Chatterjee) after he accidentally kills her mother. Her mother used to be an exorcist and Ruksana too is a devilish girl which Arnab has no clue about. After her mother’s death, Ruksana starts living with Arnab as he finds himself guilty for killing her mother. The only motive of the demons of the exorcist society wherein Ruksana belongs is to grow their population by one means or the other. But as the movie proceeds, the devilish Ruksana falls for Param and indulges in a sexual relationship with him. What happens next forms the crux of the story. Anushka’s role of the devil Ruksana is the USP of the movie. The angel-faced demon is scary enough to give you multiple heart attacks. Parambrata Chatterjee’s role of an innocent guy Param is convincing and he proved that he was the best choice by the makers. Rajat Kapoor had an extended cameo but he had a powerful screen timing, wherein he nailed every second of it. Apart from these 3, Bengali actress, Ritabhari Chakraborty, is also in the movie. Though she had a brief role, she didn’t disappoint at all. Pens down this movie can be considered as one of the best movies by a new director. Prosit Roy took a risk and delivered us a supernatural horror flick as his debut film but he emerged as a complete winner. His direction had a crisp and a sense of maturity in the filmmaking. Unlike every other Indian horror film, Prosit brings out of the box story which is unpredictable until the very end. The screen timing he has given even to the junior actors is commendable and the pace of the film and his storytelling is beyond brilliant. As a debut director, Prosit has set a benchmark for the upcoming filmmakers. This is my personal favourite part of the whole review, especially for this film. Get ready for some compliments! First, let us talk about screenplay: The movie is written by Prosit Roy and Abhishek Bannerjee and what a brilliant piece of writing they have done. Find these men and give my money to them. If we consider only Hindi horror flicks, this movie has the best story with no over the top drama and unnecessary black magic and all. The second best thing about the movie is cinematography, which is done by Jishnu Bhattacharjee. The camera work of this movie has international standards. The next best thing about the movie is dressing and makeup, which was top notch. In my opinion, the makeup artist will win major rewards for Pari. The only negative thing about Pari was the over the top sound effects. The first 30 minutes of the film had some loud and cringe-worthy sound effect, which gave me mini heart attacks. The movie had only one song which was composed by Anupam Roy. The song was average and didn’t affect the storytelling of the film. Pari has got some serious background music which is also composed by Roy and they were apt as per a horror flick. The movie is simply the best in the horror genre without any unnecessary drama. The spooky film surely deserves your time and money, so this Holi, spend some money and go enjoy the film in theatres. And remember, IT IS NOT A FAIRYTALE. Not May 4, John Abraham’s Parmanu to now come out on May 25th!